This paper provides a method for investigating neurotransmitter vesicle dynamics in neuroblastoma cells, using a synaptobrevin2-pHluorin construct and Total Internal Reflection Fluorescence Microscopy. The strategy developed for image processing and data analysis is also reported. Daniele, F., Di Cairano, E. S., Moretti, S., Piccoli, G., Perego, C. TIRFM and pH-sensitive GFP-probes to Evaluate Neurotransmitter Vesicle Dynamics in SH-SY5Y Neuroblastoma Cells: Cell Imaging and Data Analysis. J. Vis. Exp. (95), e52267, doi:10.3791/52267 (2015). Synaptic vesicles release neurotransmitters at chemical synapses through a dynamic cycle of fusion and retrieval. Monitoring synaptic activity in real time and dissecting the different steps of exo-endocytosis at the single-vesicle level are crucial for understanding synaptic functions in health and disease. Genetically-encoded pH-sensitive probes directly targeted to synaptic vesicles and Total Internal Reflection Fluorescence Microscopy (TIRFM) provide the spatio-temporal resolution necessary to follow vesicle dynamics. The evanescent field generated by total internal reflection can only excite fluorophores placed in a thin layer (<150 nm) above the glass cover on which cells adhere, exactly where the processes of exo-endocytosis take place. The resulting high-contrast images are ideally suited for vesicles tracking and quantitative analysis of fusion events. In this protocol, SH-SY5Y human neuroblastoma cells are proposed as a valuable model for studying neurotransmitter release at the single-vesicle level by TIRFM, because of their flat surface and the presence of dispersed vesicles. The methods for growing SH-SY5Y as adherent cells and for transfecting them with synapto-pHluorin are provided, as well as the technique to perform TIRFM and imaging. Finally, a strategy aiming to select, count, and analyze fusion events at whole-cell and single-vesicle levels is presented. To validate the imaging procedure and data analysis approach, the dynamics of pHluorin-tagged vesicles are analyzed under resting and stimulated (depolarizing potassium concentrations) conditions. Membrane depolarization increases the frequency of fusion events and causes a parallel raise of the net fluorescence signal recorded in whole cell. Single-vesicle analysis reveals modifications of fusion-event behavior (increased peak height and width). These data suggest that potassium depolarization not only induces a massive neurotransmitter release but also modifies the mechanism of vesicle fusion and recycling. With the appropriate fluorescent probe, this technique can be employed in different cellular systems to dissect the mechanisms of constitutive and stimulated secretion. Chemical synaptic transmission between neurons is a major mechanism of communication in the nervous system. It relies on the release of neurotransmitters through a dynamic cycle of vesicle fusion and retrieval at the presynaptic site. Many of the proteins involved in vesicle dynamics have been identified; however, their specific contribution to the phenomenon remains to be clarified1. Our understanding is partly limited by the fact that the most widely used assays for exo/endocytosis are not always the most appropriate. Several studies related to vesicle fusion and dynamics rely on electrophysiological techniques. This technique provides an optimal temporal resolution and is excellent for investigating the initial fusion of vesicles to the plasma membrane but is unable to detect many of the underlying molecular events that support presynaptic function. Electron microscopy, on the other side, provides the finest morphological description of each singular step, but the dynamic aspect of the event cannot be captured, because samples must be fixed in order to be analyzed. The advent of new optical recording techniques2,3, in combination with advances in fluorescent molecular probes development4-6, enables the visualization of exocytic processes in live cells, thus providing new levels of information about the synaptic structure and function. Initial studies exploited activity-dependent styryl dyes (FM1–43 and related organic dyes)7,8. State-of-the-art imaging techniques employ pH-sensitive variants of the Green Fluorescent Protein (GFP) (pHluorin) tethered to luminal vesicles proteins9. These probes are normally switched off when present in the vesicles because of the low luminal pH. After fusion with the plasma membrane, the vesicle interior is exposed to the neutral extracellular space, the pH abruptly increases, relieves the proton-dependent quenching of pHluorin and the fluorescent signal rapidly appears. As the change in pHluorin is faster than the fusion event, by monitoring fluorescence increases, vesicle fusion with the membrane can be measured and analyzed. Because surface pHluorin-tagged molecules are endocytosed, the fluorescence signal subsequently returns to basal level, therefore the same construct may be used also to monitor vesicle recycling9. While the vesicle-tagged pH-sensor ensures the visualization only of those vesicles that really fuse with the plasma membrane, imaging at high spatial and temporal resolution is required to describe in details the steps involved in the exo/endocytic processes. The optical technique that provides the necessary spatio-temporal resolution is total internal reflection fluorescence microscopy (TIRFM), an application of fluorescence microscopy10. Total internal reflection occurs at the interface between the glass cover-slip and the sample. When the light path reaches the glass cover-slip with an incident angle larger than the critical angle, the excitation light is not transmitted into the sample but is completely reflected back. Under these conditions, an evanescent light wave forms at the interface and propagates in the medium with less optical density (the sample). As the intensity of the evanescent field decays exponentially with distance from the interface (with a penetration depth of about 100 nm) only the fluorophores in closest proximity to the cover-slip can be excited while those further away from the boundary are not. In cells transfected with GFP-constructs, this depth corresponds to proteins expressed on the plasma membrane or in vesicular structures approaching it. As fluorophores in the cell interior cannot be excited, the background fluorescence is minimized, and an image with a very high signal/background ratio is formed11. Several characteristics make TIRFM the technique of choice for monitoring vesicles dynamics. The perfect contrast and the high signal-to-noise-ratio allow the detection of very low signals deriving from single vesicles. Chip-based image acquisition in each frame provides the temporal resolution necessary to detect highly dynamic processes. Finally, the minimal exposure of cells to light at any other plane in the sample strongly reduces phototoxicity and enables long lasting time-lapse recording12. Data analysis remains the most challenging and crucial aspect of this technique. The simplest way to monitor vesicle fusion is to measure the accumulation of reporter fluorescent proteins at the cell surface, over time13. As fusion increases, net fluorescence signal increases as well. However, this method may underestimate the process, particularly in large cells and in resting conditions, because endocytosis and photobleaching processes offset the increase in fluorescence intensity due to vesicle exocytosis. An alternative method is to follow each single fusion event14. This latter method is very sensitive and can reveal important details about the fusion mechanisms. However, it requires the manual selection of single events, because completely automated procedures to follow vesicles and to register the fluctuation of their fluorescent signals are not always available. Observation of vesicle dynamics requires sampling cells at high frequency. This generates a large amount of data that can hardly be analyzed manually. The proposal of this paper is to optimize the TIRFM imaging technique for monitoring the basal and stimulated neurotransmitter release in the SH-5YSY neuroblastoma cell line, and to describe, step-by-step, a procedure developed in the laboratory to analyze data, both at whole-cell and single-vesicle levels. NOTE: The experiments have been performed using the human neuroblastoma SH- SY5Y (ATCC# CRL-2266)15. SH-SY5Y cells grow as a mixture of floating clusters and adherent cells. Follow the instructions reported in the protocol (cell density, splitting ratio, etc.) to have cells that grow firmly attached to glass cover, which is crucial for TIRFM. Before starting, under the laminar flow biosafety cabinet, make the opportune volume of sterile phosphate buffer saline solution (PBS) and culture medium. Make 50 ml of PBS with concentrations of 150 mM NaCl, 24 mM phosphate buffer, pH 7.4. Filter the solution. Make 50 ml of cell medium from Dulbecco’s modified Eagle medium (DMEM) with high glucose, 10% heat-inactivated fetal bovine serum (FBS), penicillin (100 U/ml), streptomycin (100 µg/ml), L-glutamine (2 mM), and sodium pyruvate (1 mM). Filter the solution. Remove complete growth medium and wash the cells with 3 ml of PBS. Incubate cells with 2 ml of 0.05% trypsin-ethylenediaminetetraacetic acid (EDTA) (for 6 cm Petri dish) for 5 min at 37 °C, 5% CO2 and detach cells using pipette. Inactivate trypsin by adding 2 ml of DMEM, and collect cells by centrifugation at 300 x g for 5 min. Remove the supernatant, add 1 ml of DMEM to the pellet and pipette the solution up and down sufficiently to disperse cells into a single cell suspension. Split them 1:4 in a new 6 cm diameter Petri dish containing 3 ml of complete medium. Maintain cells in culture in 6 cm diameter Petri dishes, at 37 °C in a 5% CO2 incubator. Sub-culture once a week or when they have covered 80 - 90% of the surface area. Clean glass covers with 90% ethanol, O/N. Rinse them thoroughly in distilled water (three changes of distilled water). Dry glass covers in a drying oven. Place covers in glass Petri dishes and sterilize in a preheated oven at 200 °C for 3 hr. The day before transfection, place each coverslip in a 3.5 cm Petri dish, add 1 ml of culture medium and incubate at 37 °C in a 5% CO2 incubator. Trypsinize cells as described in steps 1.1.3 - 1.1.5, suspend the cell pellet in 1 ml of complete medium and count. Calculate the correct volume of cell suspension to add to each Petri dish to yield 3 x 105 cells/well. This density is required for optimal cell growth and efficient transfection. Incubate at 37 °C in a 5% CO2 incubator O/N. NOTE: To visualize synaptic vesicles dynamics, pCB6 vector containing synapto-pHluorin has been used. The synapto-pHluorin has been generated by in frame fusion of a pH-sensitive variant of the green fluorescent protein (GFP)16 and the vesicular membrane protein synaptobrevin 2. The construct has been extensively employed to investigate synaptic vesicle properties within neurons9. Before starting transfection, make 10 ml of the following solutions. Keep the solutions as maximal as 1 month. Make a 150 mM NaCl solution. Adjust to pH 5.5 with 0.01 N HCl. Make a PEI solution at 10% polyethylenimine (PEI; 25 kDa linear) in 150 mM NaCl solution. The pH of solution rises to 8.8. Adjust pH to 7.8 with 0.01 N HCl. 24 hr after plating, remove the medium and refresh with 1.5 ml of complete medium. Keep the cells at 37 °C, in a 5% CO2 incubator. Under the laminar flow biosafety cabinet, in a 1.5 ml microfuge tube, add 3 µg of plasmid DNA to 25 μl of 150 mM NaCl solution and 100 μl of PEI solution per 3.5 cm Petri dish. Vortex for 10 sec, then incubate the DNA/PEI mixture for 30 min at RT. Carefully add the DNA/PEI mixture to the Petri dish containing coverslips with cells and gently shake to equally distribute the reagent in the Petri dish. After 4 hr change the medium and incubate the cells O/N at 37 °C in a 5% CO2 incubator. Perform imaging experiments 24 - 48 hr after transfection. 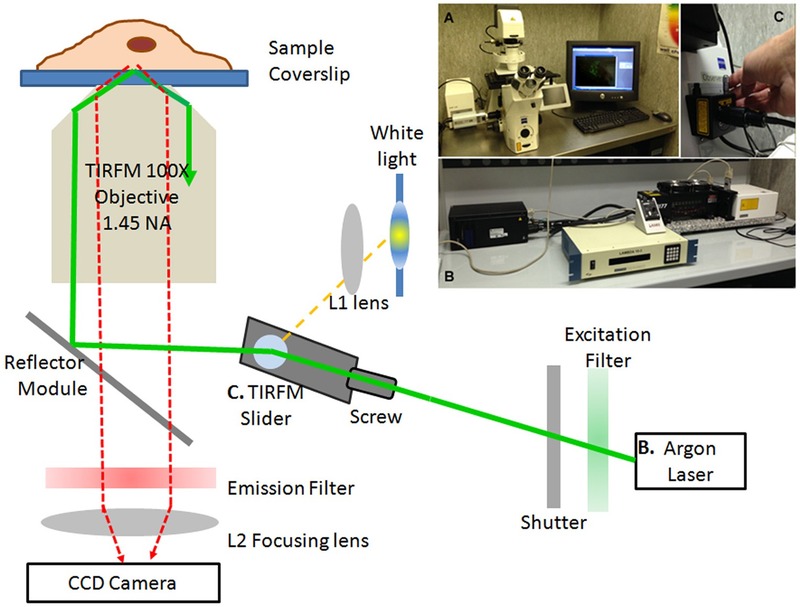 Perform TIRF imaging with the set-up described in Figure 1. It comprises a motorized inverted microscope (Figure 1, inset A), the laser source (Figure 1, inset B) and the TIRF-slider (Figure 1, inset C). Reach TIRFM illumination through a high numerical aperture (NA 1.45 Alpha Plan-Fluar) 100X oil, immersion objective. For TIRFM illumination, employ a multi-line (458/488/514 nm) 100 mW argon-ion laser. Using a mono mode fiber, introduce the linearly polarized laser light into the beam path, via the TIRF slider. Insert the TIRF slider into the luminous field diaphragm plane of the reflected-light beam path. For wide field illumination, connect the microscope to a conventional mercury short-arc lamp HBO white light. A polarization-maintaining double prism in the slider ensures the simultaneous combination of TIRF illumination and white light. Filter the laser light with an excitation filter (band width 488/10 nm) mounted on a filter wheel, introduced into the laser path. Employ a high speed, software-controlled, shutter to allow fast control of laser illumination. For pHluorin analysis, mount a band pass 525/50 nm emission filter. Capture digital images (512 x 512 pixels) on a cooled Fast CCD camera with the Image ProPlus software. Turn on the lasers, the computer, the camera, the filter wheel, and the shutter controllers; then, wait 20 min before starting the experiment as the lasers need to warm up and stabilize. Before imaging, make the opportune volume of the following solutions. Make 50 ml of Krebs (KRH) solution at 125 mM NaCl, 5 mM KCl, 1.2 mM MgSO4, 1.2 mM KH2PO4, 25 mM 4-(2-Hydroxyethyl)piperazine-1-ethanesulfonic acid (HEPES) (buffered to pH 7.4), 2 mM CaCl2, and 6 mM glucose. Make 10 ml of KCl-KRH solution (pH 7.4) at 80 mM NaCl, 50 mM KCl, 1.2 mM MgSO4, 1.2 mM KH2PO4, 25 mM HEPES (buffered to pH 7.4), 2 mM CaCl2, and 6 mM glucose. Remove the glass cover with transfected cells and insert it in the appropriate imaging chamber. Assemble the chamber and add 500 µl of KRH solution in the center of the glass. Add oil over the objective. Place the imaging chamber on the stage of the microscope and position the objective under the glass coverslip. Position the safe cover over the sample. In epifluorescence mode, focus on the coverslip (upper surface) and choose transfected cells placed in the chamber center. Select cells whose fluorescent signal can be clearly recorded using an exposure time below 80 msec. Under software control, switch to TIRF illumination in live mode. To set the TIRF configuration, check the position of the beam that emerges out of the objective, on the sample cover (Figure 2B). When the beam is positioned in the center of the objective lens (Figure 2A, left), a spot is visible in the center of the TIRF sample cover (Figure 2B, left) and the cell is imaged in epifluorescence mode (several focus planes, high background fluorescence; Figure 2C, left). To reach the critical angle, move the focused spot in the Y direction (forward or backward; Figure 2B, center) using the angle adjustment screw on the TIRF slider (Figure 1C). When the beam converges on the sample plane at an angle larger than the critical angle (Figure 2A, right), the spot disappears and a straight, thin, focused line is evident in the middle of the sample cover (Figure 2B, right). To fine-tune the TIRF angle use the cell sample (Figure 2C). Watch the fluorescence image on the video, at this stage, an epifluorescence-like image is still visible. Gently, move the screw until TIRF condition is achieved: only one optical plane of the cell is in focus (i.e., the plasma membrane in contact with the cover-slip), this results in a flat image with high contrast (Figure 2C, right). Set the single-channel time-lapse experiment. To minimize photobleaching, capture the image using low exposure time and high gain. Appropriate exposure times are between 40 - 80 msec. Acquire images at 1 - 2 Hz sampling frequency. Vesicle kinetics may be better appreciated sampling at higher frequency (10 Hz). The regular time of observation is usually 2 min. Add 500 µl of KRH solution and record cells in TIRFM mode. This is the resting condition. Save the time sequential images. Focus on the same cell and record under the same conditions of resting (laser power, time exposure, frame number). After five frames, add 500 µl of KCl-KRH solution and keep KCl in the chamber. This is the stimulated condition; save the time sequential images. NOTE: To analyze images, macros have been developed in the lab, based on existing functions of the image analysis software; similar macros are available online (URL provided in Table of Materials and Equipment). Use a “Sequence fluorescence intensity” macro for fluorescence intensity quantification in a region of interest (ROI) of the image, over the course of the movie. Open the time-sequential images. Go to the macro menu and select 'Sequence fluorescence intensity'. In the 'Analysis' window appears “select the ROI”. Choose one of the selection tools in the menu to create the ROI. Place 3 ROIs in regions of the cell membrane without spots (background ROI). Employ this “background ROI” to evaluate the photobleaching and to set the threshold for fusion event analysis (Figure 3A). To evaluate the photobleaching, open the fluorescence intensity rows “background ROIs”, (Figure 3Ba). Normalize the fluorescence intensity values in each frame to the initial intensity value (F0) (F/F0) (Figure 3Bb). Average the values. Highlight the average data and create a line plot using the chart menu options. From the data analysis menu, select “trendline” to open the plot analysis dialog. Select the type of regression. Set “exponential” regression. Then select “display equation on chart”. In the graph window, the exponential equation appears and the parameter values are automatically assigned, (Figure 3Bc). Fn = experimental fluorescence intensity measured at frame n; n = number of frames; a = bleaching factor (constant expressing the rate of intensity loss due to photobleaching; Figure 3Bd). To set the threshold, open a normalized and corrected “background ROI”, calculate the average fluorescence signal and its standard deviation (SD). The average value plus 3 SD represents the threshold (Figure 3Be). Use this threshold for data analysis. Open the time-sequential images with image analysis software. Apply a Gaussian filter to the active image sequence. Analyze images using the tool “count objects” or a macro which allows the selection of an object whose pixels have average fluorescence intensity within a defined range. Set the intensity range manually, using the threshold function (go to the bar menu, set measure → threshold to highlight the area of interest). An adequate threshold is 30% over the local fluorescent background signal. Apply ranges option (min and max inclusive) for aspect. Aspect reports the ratio between the major axis and the minor axis of the ellipse equivalent to the object. Aspect is always ≥1. Adequate values are min = 1, max = 3. Apply ranges for diameter. Diameter reports the average length of the diameters measured at two degree intervals joining two outline points and passing through the centroid of the object. Set the range in pixels (or in µm, if using a calibrated system). Define the optimal range in preliminary experiments: select manually the spots of interest and then measure their diameter using the plot profile function. Select “display objects”: selected objects will appear superimposed to the TIRFM image (Figure 4B). Include in the analysis only those spots that show a short (one to three frames) transient increase in fluorescence intensity, immediately followed by a marked loss of signal (transient spots). Employ the circular selection to create a ROI approximately one-spot diameter radially around the selected vesicle/spots (experimental ROIs). Perform this step manually. With the ROIs selected, calculate the average fluorescence intensity of each ROI over the course of the movie. Export the time-course of the fluorescence changes measured in each “experimental ROI” to a spreadsheet; (Figure 3Da). Normalize the intensity value in each frame to the initial fluorescence intensity (F/F0), (Figure 3Db). Apply the exponential correction to the intensity values in each frame as reported in step 3.2.4 (Figure 3Dc). To calculate the total number of fusion events (peak number), the time each fusion occurs (peak width) and the amplitude of fluorescent peak (peak height and AUC) apply logical functions using spreadsheet or math packages. An example of fusion event analysis using logical formulas is reported in Figure 3Dd and 3De. Assume the increase of fluorescence intensity exceeding the threshold (average background fluorescence intensity ± 3SD) as vesicle fusion to the plasma membrane and the resulting peak as a fusion event. Calculate the peak width as difference between the last and the first x value of each peak. Multiply this value for 1 / (sampling frequency). Consider this value as the time of vesicle fusion and adhesion at the plasma membrane before vesicle re-acidification and recycling (Figure 3Dd). Calculate the whole-cell AUC as a sum of values over threshold. Consider this value as net fluorescent change during the recording time due to the spontaneous (resting) or evoked (stimulated) synaptic activity. Calculate the peak height as the difference between the maximal y value of each peak and the threshold. Consider this value as indicative of the fusion type (single vs. simultaneous/sequential fusion or transient vs. full fusion). The TIRF imaging and data analysis procedures described are designed to study vesicles dynamics in cellular systems. This technique can be used to determine the effects of signaling molecules and drugs on fusion events and neurotransmitter vesicle dynamics17. Using GFP-tagged plasma membrane proteins, the TIRFM analysis has been employed to characterize the constitutive trafficking of GFP-tagged glutamate transporters in glial and epithelial cells18,19. To validate the imaging procedure and data analysis strategy reported, fusion events are recorded under basal and stimulated conditions (potassium-induced depolarization), in SH-SY5Y neuroblastoma cells transfected with synapto-pHluorin. (Video 1, 2, respectively). Two different analyses are performed: whole-cell (Figure 4) and single-vesicle analyses (Figure 5). Whole cell analysis measures the total number of fusion events in the cell and the resulting net fluorescence changes induced by stimulation. 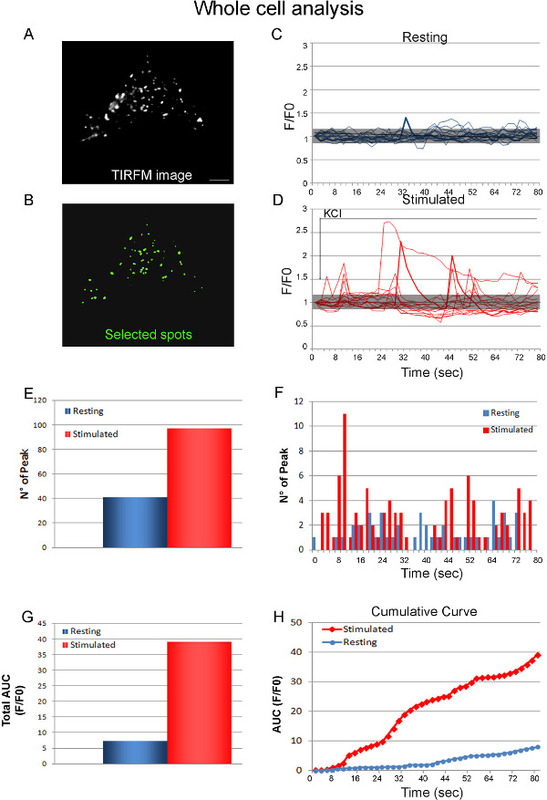 In Figure 4, synapto-pHluorin transfected cells are recorded under resting and stimulated conditions (KCl stimulation), using the same experimental protocol (time exposure, laser power, etc). Figure 4A shows that synapto-pHluorin accumulates in fluorescent puncta scattered on the cell membrane. As described in literature, a faint fluorescent signal is also present at the plasma membrane9; this signal is useful to identify cells to be imaged. In Figure 4B, spots selected by the automatic procedure described in the paper (section 3.3) are superimposed to the TIRFM image reported in Figure 4A. Figure 4C shows the normalized fluorescent intensity profiles of selected spots under resting conditions. These profiles reveal the presence of individual peaks of similar fluorescent intensity that come out at various times during the recording and probably correspond to vesicles that occasionally fuse with the membrane. Figure 4D shows the effects of KCl stimulation. As expected, depolarization with 25 mM KCl elicits a prompt response and several very bright fluorescent puncta appear at the cell membrane (Video 2). These puncta correspond to the ‘readily releasable’ pool of synaptic vesicles present beneath the plasma membrane. 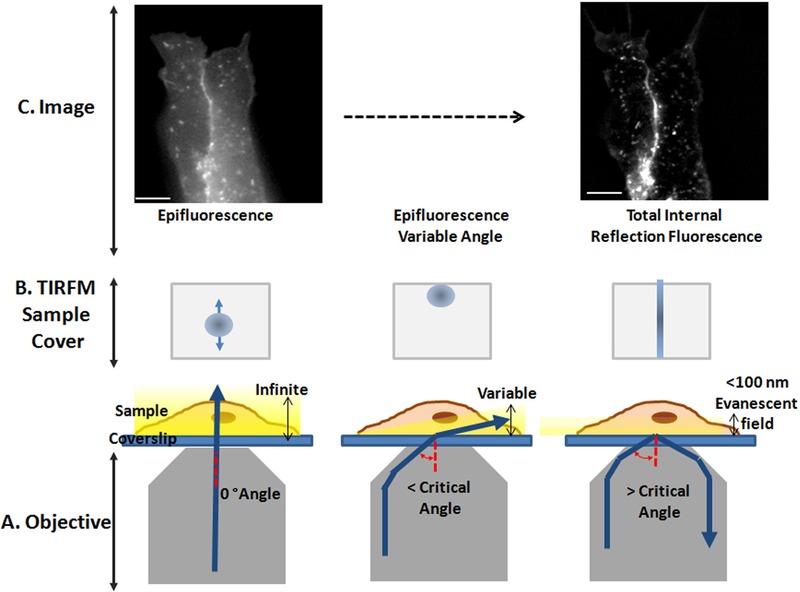 The time course analysis of fluorescent changes measured in correspondence of individual spots indicates the presence of peaks, of variable fluorescence intensity, that appear suddenly after application of the secretory stimulus (Figure 4D and 4F). Results of whole cell analysis during the time of recording are reported in Figure 4E-H. KCl stimulation causes a rapid marked increase in the number of fusion events (2.5 fold increase over resting conditions) (Figure 4E-F) and in the resulting fluorescence intensity changes (9.3 fold increase over resting conditions) (Figure 4G-H), thus indicating massive neurotransmitter release. Single-peak analysis allows the characterization of single-fusion events (Figure 5). Figure 5A shows the sequential images of a representative “experimental ROI” recorded under resting conditions. The particular highlights a synapto-pHluorin labeled vesicle which fuses with the membrane under the TIRF zone. After two frames, the fluorescent signal disappears, indicating probable vesicle retrieval and re-acidification. The normalized fluorescence profile of the region of interest (Figure 5B) measures an increase in the fluorescent signal in correspondence of the spot appearance in the TIRF zone. Conversely, the fluorescence returns to basal level after spot disappearance (single peak average width 1.91 ± 0.32 sec; average peak height 0.042 ± 0.005 normalized fluorescence intensity). Figure 5C and 5D show the sequential images of an “experimental ROI” recorded under KCl stimulation and the corresponding normalized fluorescence intensity profile. Note the increase in the movement of vesicles in and out the TIRF zone after KCl depolarization. 40 fusion events are selected and analyzed in resting and stimulated conditions. The following parameters are measured: average peak AUC, peak width and height. Peak width specifies the time of vesicle fusion, attachment and endocytosis before re-acidification and recycling, Figure 5G. Peak height measures the fluorescence intensity changes induced by vesicle fusion, Figure 5F. Changes in these parameters are indicative of different exocytosis mechanisms. Single-peak analysis reveals that KCl depolarization modifies the mode of vesicle fusion to the plasma membrane. Indeed, increase in the average peak area (3.8 ± 0.2 fold increase over resting conditions, P < 0.01 by paired t-test, Figure 5E), peak height (2.75 ± 0.03 fold increase, P < 0.01 by paired t-test, Figure 5F) and width (2.6 ± 0.5 fold increase, P < 0.05 by paired t-test. Figure 5G) are detected under stimulated conditions. Several explanations can be envisaged for these results. A possibility is that KCl depolarization causes the simultaneous and/or sequential fusion of vesicles in a constrained region of the cells. An alternative explanation is that strong depolarization favors full fusion versus transient fusion. Under basal conditions, the prevailing mechanism is a transient fusion: a fusion pore forms, the pH in the vesicle increases and the fluorescent signal appears, but the pore immediately closes, thus allowing rapid re-acidification and recycling. Under stimulated conditions, the vesicle completely fuses with the plasma membrane, the peak height and width increase as recapture of membrane vesicle components, re-acidification and recycling may require a longer period. A similar result has been recently obtained analyzing synaptic-like microvesicle exocytosis in endocrine β-cells20. Figure 1. TIRF microscope set up. Schematic view and image (inset) of the TIRF microscope system. The set up comprises the Axio Observer Z1 motorized inverted microscope (A), a multi-line 100 mW Argon-ion laser (B) and a TIRF-slider (C). The laser light (green line) and white light (yellow line) are shown. Cells are imaged using a 100 × oil immersion objective. Digital images are captured on a cooled RetigaSRV Fast CCD camera. The reflector module, the emission (488/10 nm) and the excitation (band pass 525/50 nm) filters, the collimator (L1) and focusing (L2) lens are indicated. Please click here to view a larger version of this figure. Figure 2. Getting TIRFM configuration. (A) Schematic cartoon illustrating the objective, the cover-slip, the sample and the position of the laser beam (blue line). Left, the excitation beam travels directly through the cover-slip–sample interface. The sample is excited as in epifluorescence mode. Center, the excitation beam forms with the sample an incident angle lower than the critical angle, the light illuminates the sample at a variable angle. Right, the excitation beam forms an incident angle greater than the critical angle, the light is completed reflected back into the objective lens, and an evanescent field propagates in the sample. (B) Cartoon showing the sample cover and the position of the excitation beam (blue circle), that emerges out of the objective, during the transition from epifluorescence (left) toward TIRF illumination (right). (C) epifluorescence (left) and TIRFM (right) images of synapto-pHluorin fluorescence in a live SH-SY5Y cell. Scale bar: 10 µm. Please click here to view a larger version of this figure. Figure 3. Data processing and analysis. (A) TIRFM image of synapto-pHluorin fluorescence in a live SH-SY5Y cell. The green square indicates a representative “background ROI”. Scale bar 10 µm. (B) Proposed workflow for background ROI. 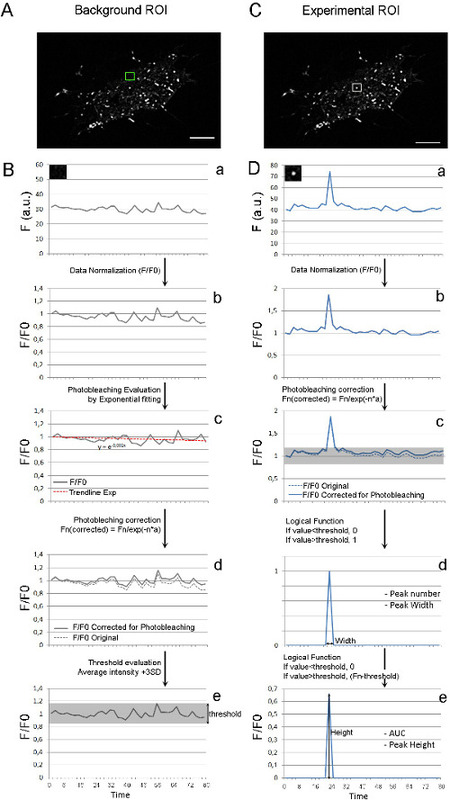 From top to bottom: a. time course of fluorescence intensity changes measured in the background ROI; b. normalization of fluorescence changes to the initial fluorescence value (F/F0); c. application of the exponential regression; d. correction for photobleaching, e. threshold evaluation (transparent gray square). (C) TIRFM image of synapto-pHluorin fluorescence in a live SH-SY5Y cell. The white square indicates a representative “experimental ROI”. Scale bar 10 µm. (D) Proposed workflow for experimental ROI. From top to bottom: a. time course of the fluorescence intensity changes; b. data normalization to the initial fluorescence value (F/F0); c. photobleaching correction; d-e. application of logical functions to detect peak number, AUC, width and height. Please click here to view a larger version of this figure. Figure 4. Whole cell analysis. (A) TIRFM image of synapto-pHluorin fluorescence in a live SH-SY5Y cell. Cells are recorded under resting and stimulated (25 mM KCl application) conditions (sampled at 1 Hz). Scale bar: 10 µm. (B) spots identified by the automatic procedure are shown superimposed (green color) on the TIRFM image. (C) Normalized fluorescence intensity profiles (F/F0) of spots selected by the automatic procedure in the whole cell under resting conditions. (D) Normalized fluorescence intensity profiles (F/F0) of selected spots under stimulated conditions. The bar over the traces indicates KCl application. (E-H) Number of events and fluorescence intensity changes recorded in the whole cell under resting (blue) and stimulated (red) conditions. (E) Histograms showing the total number of fusion events recorded in the cell. (F) Temporal distribution of fusion events. (G) Histograms representing changes in pHluorin fluorescence intensity occurring in the whole-cell (Total AUC). (H) Curves showing the cumulative pHluorin fluorescence intensity changes as a function of time. Please click here to view a larger version of this figure. Figure 5. Single-vesicle analysis. (A) SH-SY5Y cells expressing synapto-pHluorin are imaged at 1 Hz, under resting conditions. Representative TIRFM sequential images (every 2 sec) of a ROI showing a synapto-pHluorin labeled vesicle. ROI = 40 x 35 pixels. (B) Normalized fluorescence profile (F/F0) of the ROI shown in A. The black asterisk indicates a fusion event, the threshold line is shown. (C) The same cell is recorded under stimulated conditions (25 mM KCl), representative TIRFM sequential images of a ROI are shown. KCl application is indicated by the yellow asterisk. (D) The normalized fluorescence profile of the region shown in C highlights the arrival (in) and disappearance (out) of vesicles. Black asterisks indicate fusion events, the threshold line is shown. (E-G) properties of single-vesicle events recorded under resting (blue bar) and stimulated (red bar) conditions. n = 40 fusion events. (E) Left, peak area (AUC) is indicated by light blue; right, histograms of average peak areas; **p<0.01. (F) Left, peak height (h) is indicated by a double-headed arrow; center, histograms of the average peak height; **p < 0.01; right, peak height specifies the fusion mechanism. The star in the cartoon indicates synapto-pHluorin. (G) Left, peak width is indicated by a double-headed arrow; center, histograms of the average peak width; *p < 0.05; right, peak width specifies the time of vesicle exocytosis, attachment and endocytosis. The star color is green when the synapto-pHluorin fluorescence is visible and gray when it is switched-off. Please click here to view a larger version of this figure. Video 1. SH-SY5Y cells expressing synapto-pHluorin are recorded under resting conditions (sampled at 1 Hz). Please click here to view this video. Video 2. SH-SY5Y cells expressing synapto-pHluorin are recorded under stimulated conditions (sampled at 1 Hz). KCl perfusion is indicated. Please click here to view this video. This paper presents a protocol to image and analyze vesicles dynamics in secreting cells, using fluorescent cDNA-encoded vectors and TIRFM. Key elements of successful imaging by TIRFM are the selection of the cellular model and cell transfection with genetically-encoded optical indicators of vesicle release and recycling. TIRFM is ideally suited for cells growing adherent to a glass cover and sufficiently flat to allow stable visualization of membranes and fusion events. Vesicles should ideally be dispersed in the cell so that their trafficking, fusion and endocytosis can be imaged and quantified at single-vesicle level. Unfortunately, neurons do not meet these criteria: they have irregular shapes, neurites which frequently cross over each other, and vesicles fusion is prevalently concentrated in small regions (active zones). For these regions is very difficult to study vesicle dynamics by TIRFM in primary cultures of neurons. We demonstrate for the first time that the SH-SY5Y human neuroblastoma cell line can be a valuable alternative model to investigate neurotransmitter release under resting and stimulated conditions, by TIRFM. This cell line has a neuronal phenotype with a cellular body and thin processes, possesses enzymes for neurotransmitter synthesis, proteins of the synaptic machinery, and a regulated secretion. Furthermore, it can be differentiated into a functionally mature neuronal phenotype in the presence of various agents, including retinoic acid, phorbol esters, and dibutyryl cyclic AMP21,22. Cells are sufficiently flat to allow stable visualization of membranes and fusion events in TIRFM mode (particularly in the cell body) and vesicles are relatively dispersed. Finally, cells can be easily transfected with plasmid encoding GFP-labeled proteins or pH-sensitive protein tags using different transfection reagents. In this protocol, PEI has been used to transfect the cells. This reagent constitutes the basis of most commercially available transfection agents and alone acts as a very cost-effective transfection vector. A 20% efficiency of transfection is expected using the above reported protocol which is adequate for single cell imaging. While the availability of different transfection reagents and procedures makes transfection almost a standard procedure in SH-SY5Y and even in primary neuronal cultures, care must be taken when recording, analyzing and interpreting TIRFM data. TIRFM facilitates the collection of information regarding processes that occur at or near the membrane in living cells, and enables the analysis of individual molecular events through detection of changes in the fluorescent signal derived from tagged proteins that move in or out the evanescent filed. However, several factors can modify the fluorescent signals in this zone, without necessarily implying exo/endocytic events, and this must be taken into consideration when recording and analyzing data. Among these are morphological changes in the cell, particularly those concerning the plane in focus under the evanescent field and fluorophore modifications during recording. The high resolution of the TIRF technique relies on the excitation of fluorophores within the evanescent field, with the depth of 100 nm from the glass interface11. This is a very thin zone and imperceptible morphological modifications are expected to change the cell plane in focus. This particularly applies to neurons and cells that present several processes and exhibit pronounced ruffling. In these cells, the membrane area in contact with the cover-slip during recording is irregular and can rapidly change, thus causing inaccurate evaluation of exocytosis. For this reason, whenever possible, it is important to select the cellular model of investigation. To limit cell movements can be helpful to coat glass-covers with extracellular matrix proteins or poly-l-lysine. However, one must keep in mind that these substrates may modify cell behavior and vesicle dynamics. Other possible sources of morphological modifications during recording are cell stimulation, addition of solutions, and temperature changes. Stimuli able to induce massive vesicles release (i.e., KCl depolarization) often cause cell shrinkage which obviously modifies the cell surface under the TIRF zone. It is therefore important to select accurately the type, concentration, and application time of the stimulus in preliminary experiments. The simple introduction of solutions into the bath with a pipette, independently of the composition, may cause modification of cell morphology by shear stress. To solve this artifact, add medium preferably using a perfusion system, possibly connected with a vacuum pump to reduce noise. Cell morphology and function are extremely sensitive to temperature variations due to experimental environment, medium addition and intense laser illumination. The temperature control in live-cell imaging is normally achieved using incubators; small (stage-top) and large (chamber) incubators are available. The former are particularly handy and well suited for the observation of cell cultures, the latter guarantee a constant temperature of all devices inside the incubator, including a large part of the microscope, thus minimizing the focus drift resulting from temperature gradient. In the absence of a temperature regulatory system, it is critical to equilibrate cells, live-cell imaging chamber, and solutions to RT and to avoid long-term imaging experiments. Alteration of fluorescent signals may also be due to modification of the fluorophore during recording. The most important is photobleaching23. Photobleaching is the photon-induced decomposition of a fluorophore. It generally causes a permanent loss of fluorescence and dimming of the observed sample over time. In TIRFM, only fluorophores closed to the origin of the evanescent field can be photobleached and GFP-tagged membrane proteins are photobleached because they reside in this field. The prevention of the fading of fluorescence emission intensity is very important to obtain high-quality images, and obligatory for quantitative fluorescence microscopy. With a reasonable approximation, for a given molecule in a constant environment, photobleaching depends on the time and the cycle of exposure to the excitation source. In many instances, photobleaching follows a simple exponential decay function, which makes its assessment and its correction easier by performing control recordings23. Different correction formulas/macros are available online (see Table of materials and equipments); in the protocol a simple exponential function has been used. There are several strategies to overcome photobleaching. A good strategy is to prevent photobleaching at the source, for example, using fluorophores with high photostability. Unfortunately, right now, the choice of DNA-encoded probes is still limited. In this case, loss of activity caused by photobleaching can be minimized during imaging acquisition, optimizing time-span of light exposure, the photon energy of the input light and the frequency of sampling. When using pH-sensitive probes, a further source of fluorophore modification during recording is the pH shift in the medium. The liquid volume of the recording chamber is usually very low and drug application, cell activity and metabolism may modify the pH of the medium, particularly in the tiny volume between the cell and the surface of the coverslip. This in turn, changes the pHluorin fluorescent signal, thus causing over/under-estimate of vesicle release. For example, strong stimulations may lead to a calcium-dependent acidification of the cytosol and mirrored alkalization in the extracellular space, thus resulting in an exaggerated increase in the fluorescent signal24. To avoid this problem, always use buffered solutions and monitor possible pH modifications introduced by the established protocol, in preliminary experiments. For a more accurate estimate of evoked vesicle release, when analyzing data, monitor the fluorescence signal in a region of the cell surface without fusion events, and use modifications of the fluorescent signal within this region as adjustment factor. In conclusion, a method for monitoring and analyzing vesicle fusion and dynamics has been described. This technique can be used in different cell types (neurons and endocrine cells) to visualize and dissect the various steps of exo/endocytosis, to reveal the role of proteins and their pathogenic mutants in the regulation of vesicle dynamics and to uncover the mechanisms of action of drugs targeting constitutive and regulated exocytosis. The authors would like to acknowledge the Università degli Studi di Milano for support to Eliana Di Cairano (Post-doctoral fellowship) and Stefania Moretti (Ph.D. fellowship). This work was supported by the University Research Program PUR to C.P. We would like to thank Prof. Jeremy M. Henley, School of Biochemistry, University of Bristol, United Kingdom, for the pHluorin construct and Dr. Dotti Francesco for assistance in data analysis, and Silvia Marsicano for technical assistance. Sudhof, T. C. The synaptic vesicle cycle. Annu. Rev. Neurosci. 27, 509-547 (1146). Denk, W., Svoboda, K. Photon upmanship: why multiphoton imaging is more than a gimmick. Neuron. 18, (3), 351-357 (1997). Helmchen, F., Svoboda, K., Denk, W., Tank, D. W. In vivo dendritic calcium dynamics in deep-layer cortical pyramidal neurons. Nat Neurosci. 2, (11), 989-996 (1999). Tsien, R. Y. The green fluorescent protein. Annu Rev Biochem. 67, 509-544 (1998). Matz, M. V., et al. Fluorescent proteins from non bioluminescent Anthozoa species. Nat Biotechnol. 17, (10), 969-9673 (1999). Ribchester, R. R., Mao, F., Betz, W. J. Optical measurements of activity-dependent membrane recycling in motor nerve terminals of mammalian skeletal muscle. Proc Biol Sci. 255, (1342), 61-66 (1994). Polo-Parada, L., Bose, C. M., Landmesser, L. T. Alterations in transmission, vesicle dynamics, and transmitter release machinery at NCAM-deficient neuromuscular junctions. Neuron. 32, (5), 815-828 (2001). Gaffield, M. A., Betz, W. J. Imaging synaptic vesicle exocytosis and endocytosis with FM dyes. Nat Protoc. 1, (6), 2916-2921 (2006). Miesenböck, G., De Angelis, D. A., Rothman, J. E. Visualizing secretion and synaptic transmission with pH-sensitive green fluorescent proteins. Nature. 394, (6689), 192-195 (1998). Axelrod, D. Total internal reflection fluorescence microscopy. Methods Cell. Biol. 89, 169-221 (2008). Sankaranarayanan, S., De Angelis, D., Rothman, J. E., Ryan, T. A. The Use of pHluorins for Optical Measurements of Presynaptic Activity. Biophys. J. 79, 2199-2208 (2000). Mattheyses, A. L., Simon, S. M., Rappoport, J. Z. Imaging with total internal reflection fluorescence microscopy for the cell biologist. J. Cell Sci. 123, 3621-3628 (2010). Wyatt, R. M. Balice-Gordon R.J. Heterogeneity in Synaptic Vesicle Release at Neuromuscular Synapses of Mice Expressing SynaptopHluorin. J. Neurosci. 28, (1), 325-335 (2008). Tsuboi, T., Rutter, G. A. Multiple forms of "kiss-and-run" exocytosis revealed by evanescent wave microscopy. Curr Biol. 13, 563-567 (2003). Miloso, M., et al. Retinoic Acid-Induced Neuritogenesis of Human Neuroblastoma SH-SY5Y Cells Is ERK Independent and PKC Dependent. J. Neurosci. Res. 75, 241-252 (2004). Jaskolski, F., Mayo-Martin, B., Jane, D., Henley, J. M. Dynamin-dependent Membrane Drift Recruits AMPA Receptors to Dendritic Spines. J Biol Chem. 284, (18), 12491-12503 (2009). Treccani, G., et al. Stress and corticosterone rapidly increase the readily releasable pool of glutamate vesicles in synaptic terminals of prefrontal and frontal cortex. Mol Psychiatry. 19, (4), 433-443 (1038). D'Amico, A., et al. The surface density of the glutamate transporter EAAC1 is controlled by interactions with PDZK1 and AP2 adaptor complexes. Traffic. 11, (11), 1455-1470 (2010). Perego, C., Di Cairano, E. S., Ballabio, M., Magnaghi, V. Neurosteroid allopregnanolone regulates EAAC1-mediated glutamate uptake and triggers actin changes in Schwann cells. J Cell Physiol. 227, (4), 1740-1751 (2012). Bergeron, A., Pucci, L., Bezzi, P., Regazzi, R. Analysis of synaptic-like microvesicles exocytosis of B-cells using a live imaging technique. PlosOne. 9, e87758 (2014). Encinas, M., et al. Sequential treatment of SH-Sy5Y cells with retinoic acid and brain-derived neurotrophic factor gives rise to fully differentiated, neutrophic factor-dependent, human neuron-like cells. J. Neurochem. 75, (3), 991-1003 (2000). Kume, T., et al. Dibutyryl cyclic AMP induces differentiation of human neuroblastoma SH-SY5Y cells into a noradrenergic phenotype. Neurosci Lett. 443, (3), 199-203 (2008). Diaspro, A., Chirico, G., Usai, C., Ramoino, P., Dobrucki, J. Photobleaching. Handbook of Biological Confocal Microscopy. Pawley, J. B. Springer-Verlag New York, Inc.. New York. 690-699 (2006). 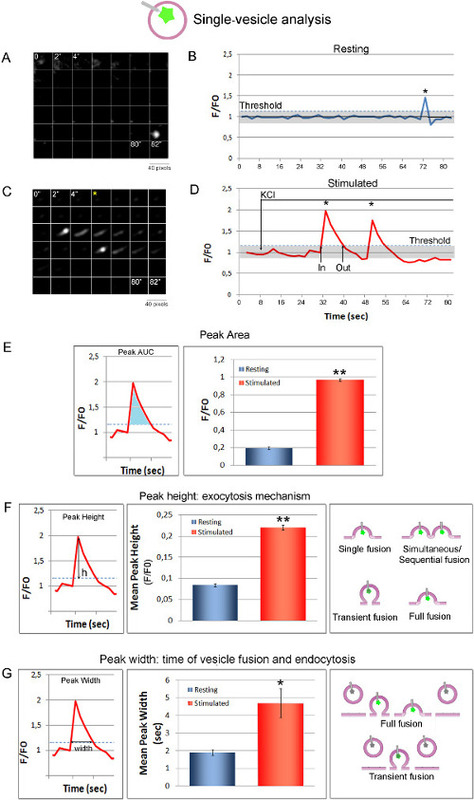 Rossano, A. J., Chouhan, A. K., Macleod, G. M. Genetically encoded pH-indicators reveal activity-dependent cytosolic acidification of Drosophila motor nerve termini in vivo. J Physiol. 591, (7), 1691-1706 (2013).